Keep your color-treated hair vibrant. This shampoo, infused with Amazonian murumuru butter, moisturizes for a healthy looking gloss. A fragrant kiss of nature and juicy freshness from the handpicked Bulgarian rose petal. This shampoo is also 93% Naturally Derived and cruelty-free, paraben-free, silicone-free, sulfate-free, dye-free, & formulated without phthalates. Read our Naturally Derived Page to find out more. Life should be full of color. That’s why our Blooming Color Sulfate-Free Shampoo is designed to deliver a healthy shine while protecting colored hair. The formula is infused with organic murumuru butter that is sourced from a certified sustainable source in Brazil. Also infused is ethically sourced rose absolute from Bulgaria. Our Blooming Color Shampoo exudes a rich, warm floral rose experience. In this fragrance the natural vibrancy of the rose notes is enhanced by the juicy freshness of red berries delivering an intensely feminine and refreshing ambiance in your shower. • You know the drill but here it is - apply Love Beauty and Planet® Blooming Color Shampoo to wet hair. Gently massage the scalp and roots with fingertips to work into a lather. • Lightly squeeze the Blooming Color Shampoo out from roots to ends and rinse thoroughly. 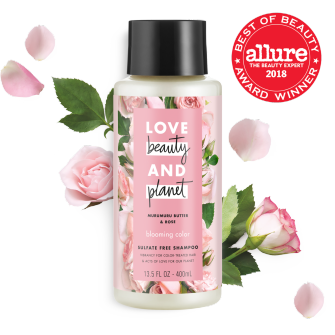 Love Beauty and Planet® Sulfate Free Blooming Color Shampoo, infused with murumuru butter softens and protects hair. 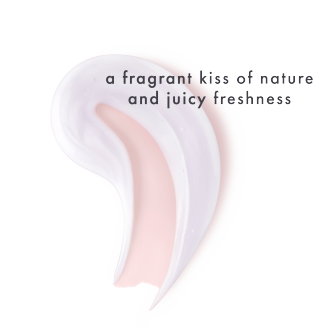 Experience our fragrance infused with Bulgarian rose absolute for a juicy kiss of nature with every wash.
sulfate-free murumuru butter & rose shampoo is rated 4.5 out of 5 by 123. Rated 5 out of 5 by vverbey from This might be my new favorite shampoo! I used very little product to achieve a thick lather for my hair. My hair is past my shoulders and normally requires a larger amount of shampoo to thoroughly clean my hair. My hair is super soft after using Murumuru Butter & Rose Oil Shampoo Blooming Color. My hair is color treated and can knott very easily, this prevented that. I also love how i can smell the product the next day, normally my shampoo never leaves a lasting smell. I loved trying this product for free for an honest review. I will absolutely be purchasing this in the future! Rated 4 out of 5 by jenniferfountai from My first thought when I got this was "I can't wait to try this! It smells so good!" This shampoo didn't disappoint one bit, it left my hair smelling great and feeling extremely soft when paired with the Murumuru Butter & Rose Oil Conditioner. I have only used it once at this point so I can't say how the results will vary in the long run however as it stands now I like the product and will continue to use it until my sample is gone and perhaps purchase another bottle once it's gone. Rated 1 out of 5 by Sweetpea from Disappointed I bought the shampoo and conditioner because it smelled amazing. However after washing my hair it was a fight to get all the tangles out of my hair. It did not make my hair soft at all. The only pro was the scent. I will not be using this product anymore. Rated 5 out of 5 by Katya from Wonderful product and wonderful message!! This shampoo not only smells amazing (fragrance lasts throughout the day), it also does wonders for the hair and our planet! I'm instantly a huge fan of this brand; innovative, effective and conscious.